We see lots of berries over the summer. I love seeing all of them lined up at grocery stores since I love love love berries in my baked goods. Strawberry season ends around August apparently, so why not take advantage of those luscious berries and make a cake that celebrates summer, before summer ends next week? So, I made this poke cake. And, it`s super duper delicious. I think I`m going to add this with one of my favorites dessert list, because it`s just so darn GOOD. I wanted to share with you guys more recipes with berries before summer was over, but I`m running out of time! I didn`t realize this summer would be so busy for me. I started another job earlier on Monday, so now I have two jobs, an online class, and this blog to maintain! 1. Grease a 13inx9in baking pan/or use parchment paper. 2. Preheat oven to 350°F, with rack in the middle of the oven. 5. In the bowl of your mixer, beat together the butter and sugar until light and fluffy. 6. Add half the dry ingredients (flour mixture) into the butter/sugar bowl and mix until everything is incorporated. 7. Then, add half of the wet ingredients (milk mixture) and mix until everything is incorporated. 8. Repeat with remaining dry and wet ingredients. Make sure everything is combined. 9. Pour into baking pan and bake for 35 minutes, or until a toothpick comes out clean when inserted. Rotate baking pan 180° halfway through baking time (17 minutes). 10. Cool the cake completely in the pan for at least 1 hour. 11. Place a strainer/fine mesh on top of a medium bowl. Set aside. 12. In the medium saucepan, combine the strawberries, sugar, and water and cook covered until strawberries are soft (this will take about 10 minutes). 13. Pour the strawberry mixture over the strainer into the bowl. (I used a wooden spoon to press all the liquids from the strawberries) Then, discard the strawberries. 14. Whisk the strawberry gelatin into the liquid. Allow it to cool to room temperature. 15. Once cake has cooled, poke holes into the cake with a skewer/chopsticks (about 50ish). 16. 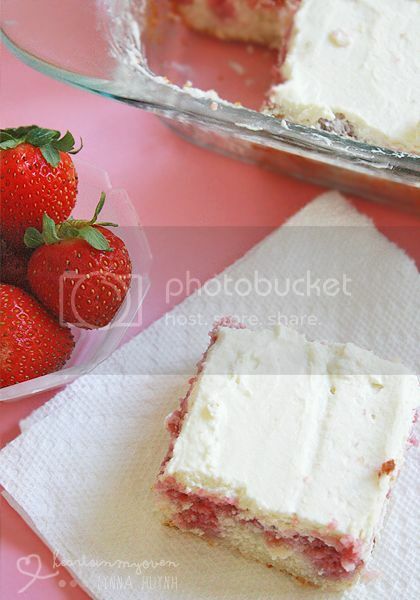 Pour the strawberry syrup all over the cake gently, making sure to get the entire cake surface. 17. Wrap the cake with saran wrap and refrigerate for at least 3 hours (up to 2 days). 18. In a medium bowl with electric mixer, combine the heavy cream, sugar, lime juice, and zest. Beat together until soft peaks form. 19. 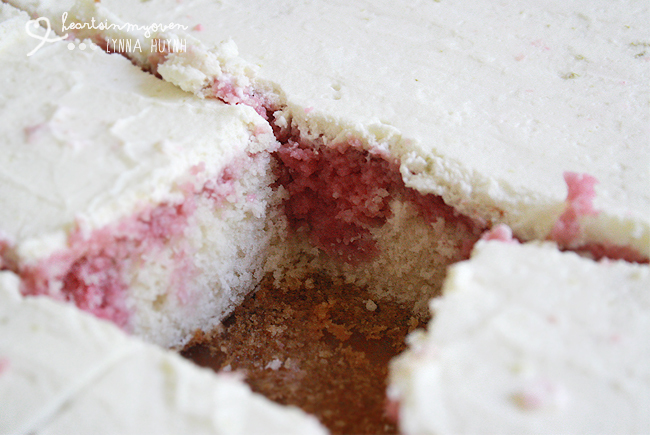 Once cake has set in the refrigerator, spread an even layer of lime whipped cream on top. 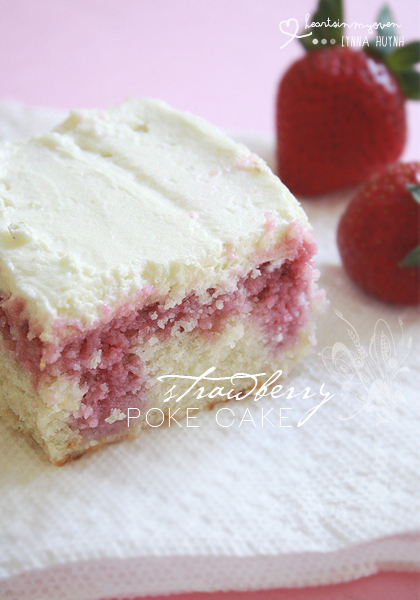 I am no familiar with poke cake but it sure is a good idea! It`s a beautiful and DELICIOUS cake! I am also in love with berries. How fast summer goes, right? I need to make more treats with berries too, thanks for reminding me! Also, I admire how much you can get done, it sounds like you are quite the busy bee! I`m not sure how long I`ll long! LOL. but, thanks! These photos have me drooling! The colors are absolutely stunning. Mmm the cake looks so soft and delicious! What a sweet a pretty cake! Aww, thank you Nami! Ahah, I can`t wait until school starts so I have time to bake more often as well! Can you believe I've never made a poke cake? I'm so going to try this - looks so good! I haven`t tried it until I made this! So, not surprising! :) Please do! It`s delicious!